I probably told you that my Mom taught preschool. It's pretty handy, especially with two young kids! Also handy that my parents recently downsized, (they moved thirty minutes closer) and I got some stuff I never knew I needed. Among the things I got was some of my Mom's preschool collection: books, puzzles and craft projects. I could seriously plan my kids lesson plans for every minute of the day with the books she gave me! One of the gems I pulled out was a button bag! GASP!! You don't know what a button bag is?? Okay neither did I but it is now every day language around our house. My mom put together a "button activity bag" with sorting activities for multiple levels as well as button themed books! For Simon's age group, two years old, we did button sorting by color. She drew columns on small posterboard and labeled each with a color. She actually wrote the word in the corresponding color. The kids sort the buttons by color and also practicing seeing the word correspond with its meaning. Simon and his friends got the concept quickly! While Maya, my six year old, was perfectly happy to sort buttons by color I had her do the more complicated project! She had to not only sort by color but also by number of holes in the buttons! We also sorted the buttons by size; there are endless possibilities! What kind of projects do you do with buttons? I pretty much hate my fridge. Don't get me wrong. It works and it holds a lot of food. I just don't like its looks. 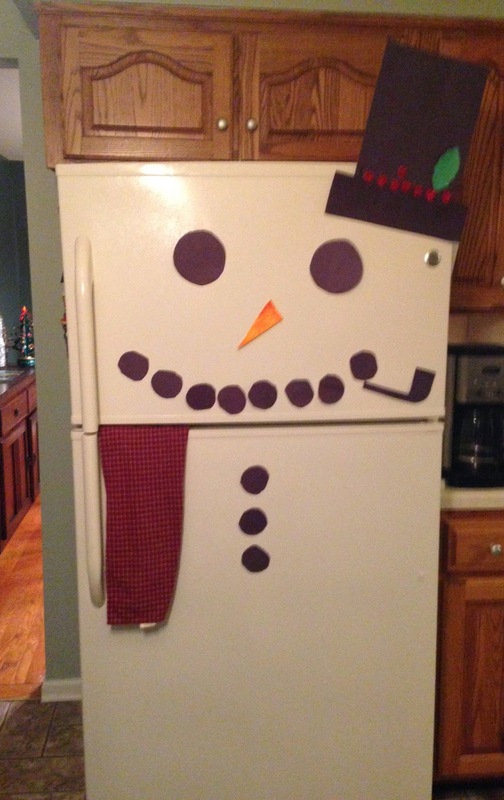 Anna and I created this today and I think I will love it for the rest of winter (or until we take it down). By the way, it was Bill's idea to put the towel in the door for the scarf (which was brilliant!). And sorry for not posting lately. Sarah and I were caught up with life. 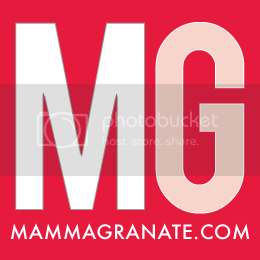 Keep checking back for more posts! Hey friends, sorry we haven't posted in a while! Between Thanksgiving, my family battling ever single germ that has ever existed (or at least that's how it felt) and Mandi's house getting painted which has taken over we have been on a posting hiatus. I'm going to do my best to get back posting now that our holidays are over here. Today though I'm going to leave you with some pictures of a little known fact. 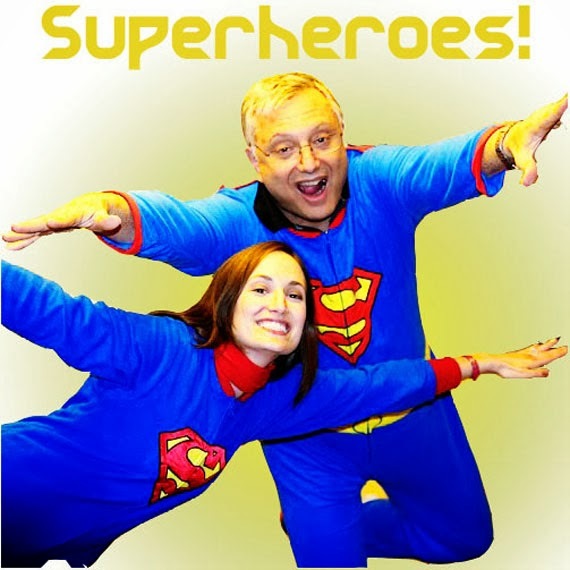 My Dad and I are superheros. Yup, we got ourselves some Target PJs and turned into superheros! Thank goodness that my Dad was there to help me learn to fly. 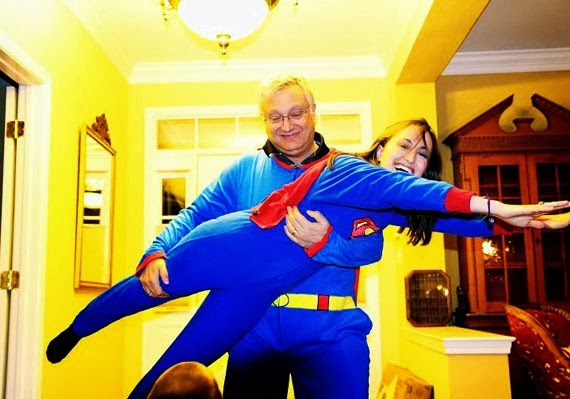 He's a special kind of guy to help his adult daughter learn to fly. As you see from the first picture he was quite successful. 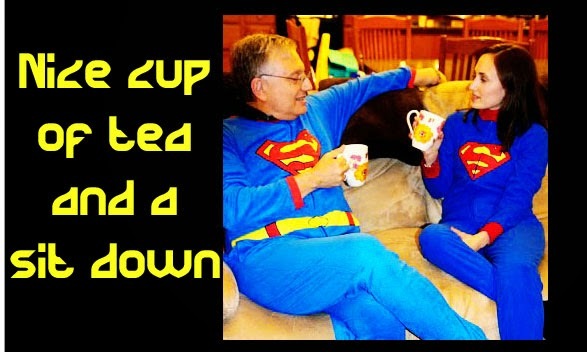 Luckily I was also there to help my Dad learn how to relax with a cup of tea after a long day of superhero-ing. A nice cup of tea and a sit down! I'm not sure if you were aware but I live with a spy. She is six years old and is working hard to creep around my house, unseen, while asking me not to look at her. She was lucky enough to get some awesome spy stuff from her friends for her birthday, binoculars that see in the dark, glasses you can see behind you and some other fun tools! My sister decided to add to her fun with some invisible ink markers. They are awesome!! 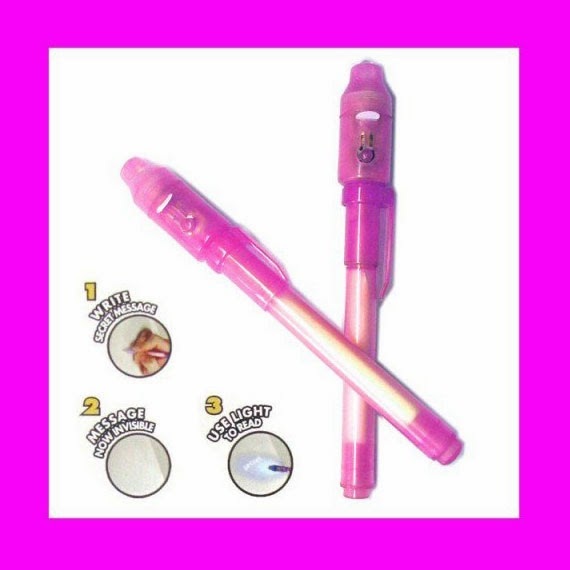 They write completely clear and you can only see the message with a black light that comes on the cap of the marker. It's meant to be for paper but Maya uses them to write secret messages on my hand. Anna was over yesterday and they took it to a new level. If you look at my hands and feet in black light secret messages will appear!!! These markers are cheap, you can get them on Amazon Prime and provide my kids with hours of amusement!! What does your baby want from Santa? A ridiculous question. If it is your first baby it is pretty easy to come up with a few little things that are sure to make a baby smile. When you are on child number three. You do not need any more toys. So you search and search for something that is different from the five million other toys that you have. William recently received this Roll and Swirl Ball Ramp by The Early Years as a gift and he loves it. 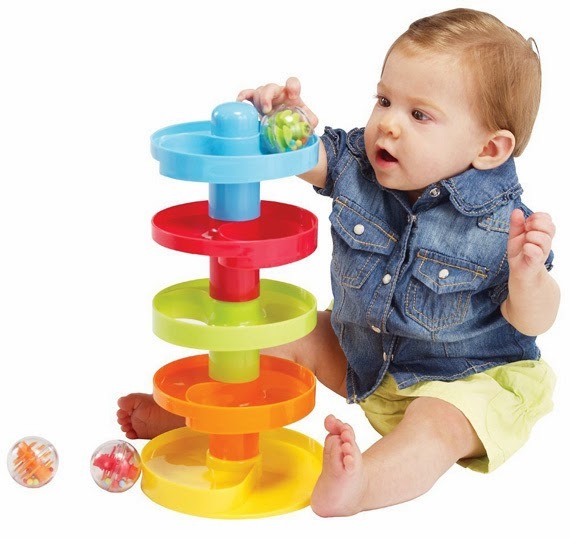 It is a very simple plastic toy that stacks up to make a track. The ball rolls around the track and then drops down through the hole and again and again until it reaches the floor. William can put the ball in himself (he is 11 months old). I love how simple this toy is nothing flashes or plays music. Which is quite refreshing! 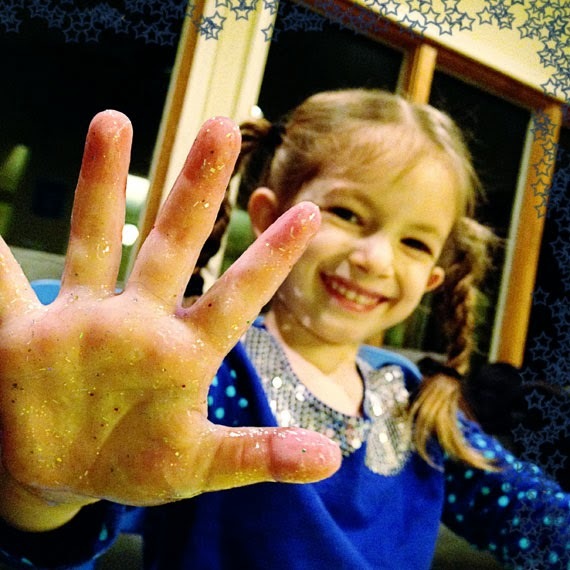 Sparkles are a big deal in our house. We love anything that sparkles! We especially love holiday lights although we, unfortunately, don't participate. It's not that we are against them for our house but I just don't even know where to begin!!! When I was teaching I tried to think of winter crafts that weren't holiday specific. My first/second grade classroom had kids who loved crafts and closer to the holidays it was fun to be more relaxed and make things to decorate our classroom. 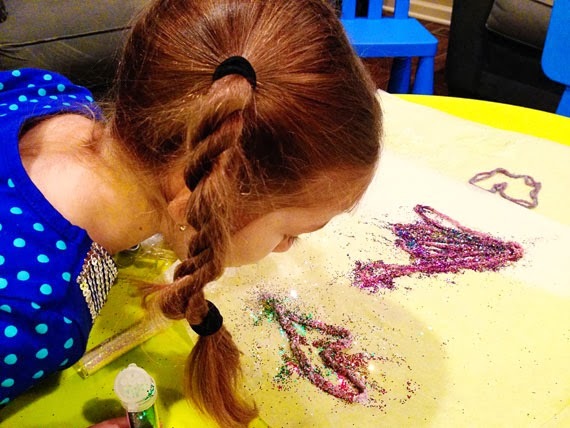 What better to decorate with than glitter! 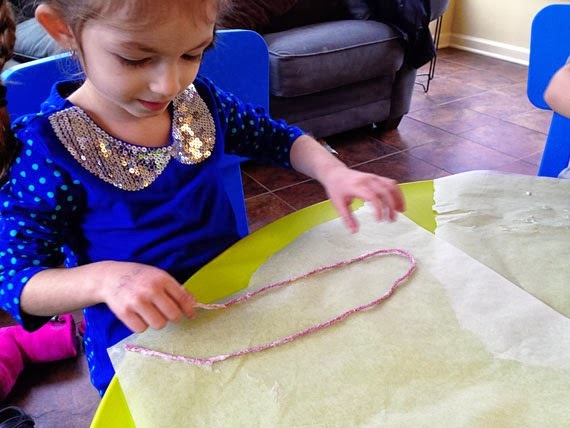 Glitter ornaments are great to hang on Christmas trees, windows, even make a mobile! Ours reside on our window just to add a bit of sparkle to our dining room! First you take a piece of yarn, the length of your choice, and coat it in Elmers glue. When the yarn is thoroughly covered with glue shape it on a surface that it will not permanently stick to. 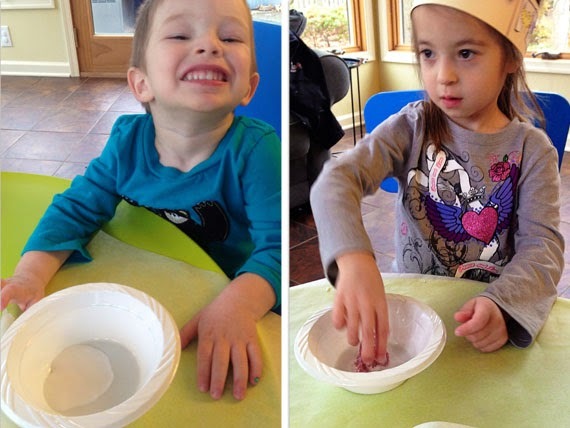 We used parchment paper but I think that a ziplock bag would have been easier to peel it off of. Now sparkle it up!! Sprinkle glitter on the yarn so it's coated to your desire and let it dry. Maya sprinkled the glitter and blew on it to make the colors mix together. FYI this is not a clean project but it does leave your hands fantastically sparkly!! Need an idea for your little one for Christmas? 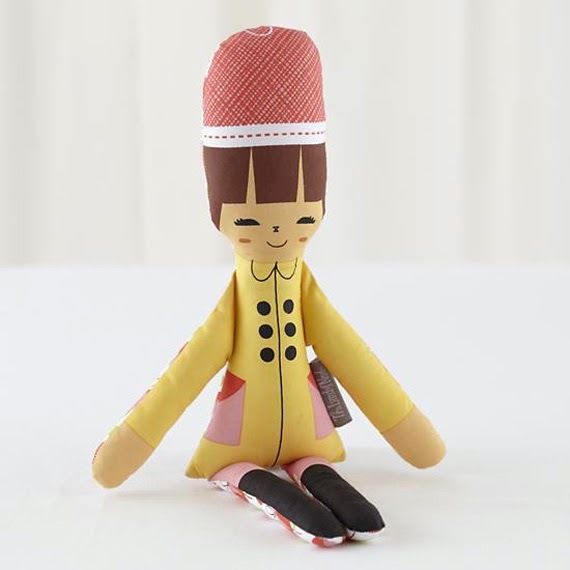 Check out these Hello Dolls, a Land of Nod exclusive. They come in various adorable styles. 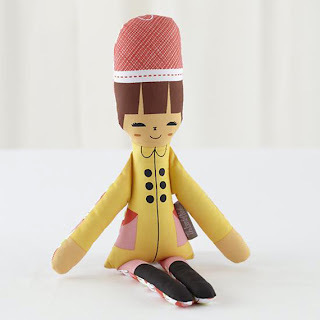 These dolls are designed by Suzy Ultman, are made of printed fabrics, and are soft from head to toe. They're perfect for little ones to carry around everywhere they go. If there is a doll out there that is more adorable than this, please send me a picture right now!! Check out the other style options. Land of Nod has $4.95 all-you-can-ship, so you can load up on all the must-have toys. I've been off Pinterest for a bit. No particular reason but I finally came to my senses and got myself back on! 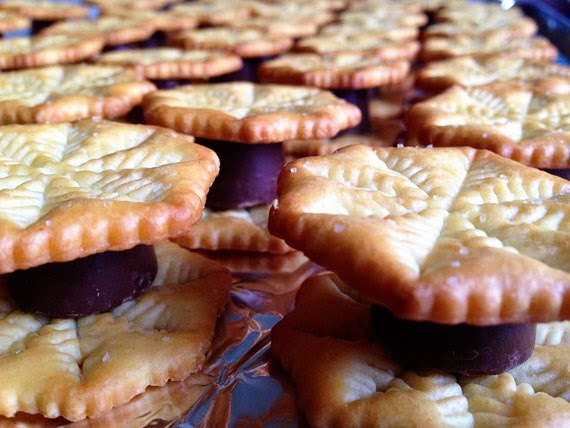 Amidst the fancy schmancy recipes that involve more brain power I can muster I found the idea for rolo stuffed ritz crackers. They looked amazing. 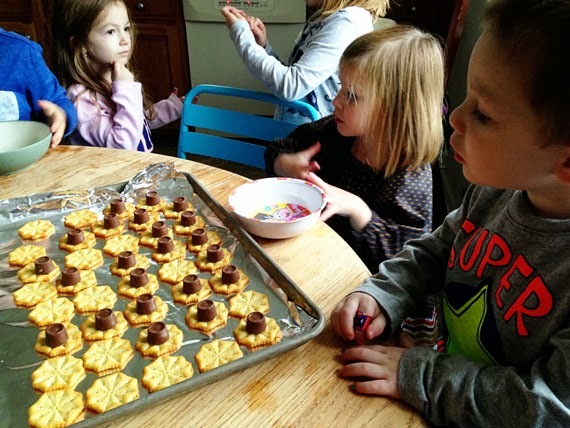 I went out before Thanksgiving to get the ingredients and I had plans to have the kids put these together while I was cleaning for our company. Problem is that I forgot about them. Totally forgot. Well lucky for me when we had an impromptu dinner date with Mandi and Brina (and families) and I wanted to bring dessert I remembered them! I brought all the ingredients and Addie and Simon put them together for us! 1. 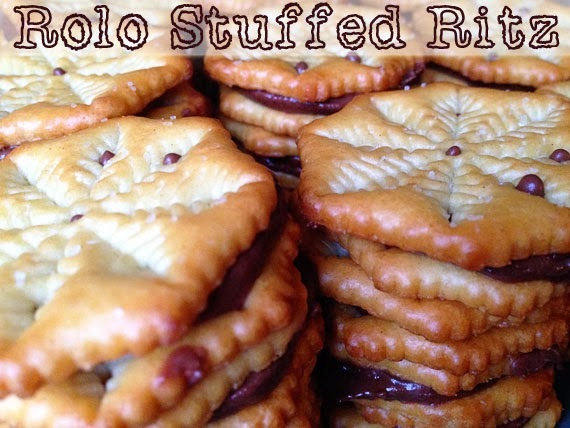 Put a Rolo on a Ritz Cracker. 2. Top with another Ritz Cracker. 3. Bake at 250ºF for 5 minutes. 4. 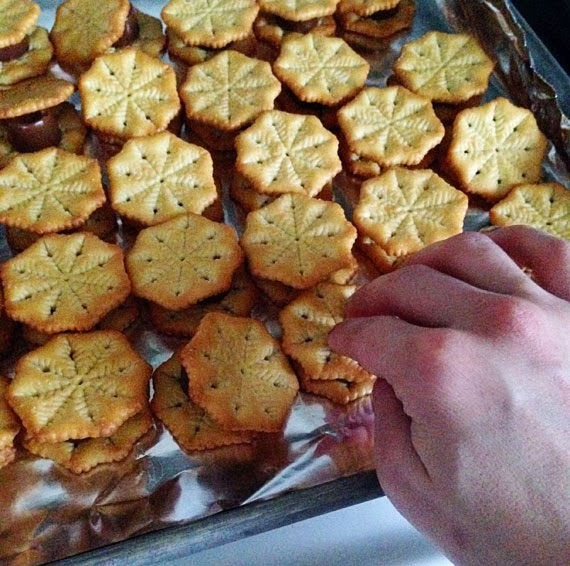 Smush the crackers down and enjoy!